Productive services with the help of internet technologies. It's about how new digital technologies can "cure" the long-standing concern of services suffering from low productivity growth. That's not longer a necessary development. Yet, to let new digital technologies do what's best to make services more productive, policies need to be set right. Read the blog for why and how that can be done. Last month, I wrote about how digital trade restrictiveness of countries is associated with how much countries participate in Global Value Chains (GVCs). This follow-up column explains how digital trade restrictions are also strongly associated with where countries participate in GVCs. In another blog post, I made clear that the use of ICT in GVCs is unrelated with the complexity of value chains. 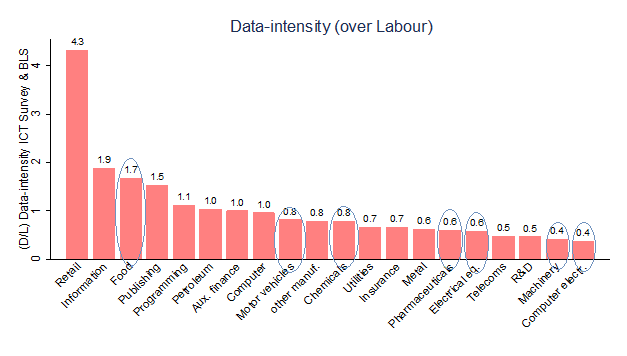 Instead, ICT-intensity of GVCs relates better with the relative position of industries in value chains. That is, where industries are most active in GVCs. In fact, industries closer to consumers are often industries that are also relatively more ICT-intense. They are placed more downstream. Vice versa, industries that are more upstream often appear less ICT-intense. Now, this pattern is also reflected with regards to countries’ digital trade policy framework: countries that are less restricted across the whole range of digital trade policies are more active in supply chains that are closer to the final consumer, i.e. more downstream. On the other hand, countries that are more restricted with digital trade policies are often trading more in upstream value chains, being further away from final consumers. This can be seen in the figure below. The vertical axis plots a measure of the relative position of countries in their supply chains. Higher values on this indicator means higher GVC “upstreamness” of countries, trading more in GVS that are more upstream. 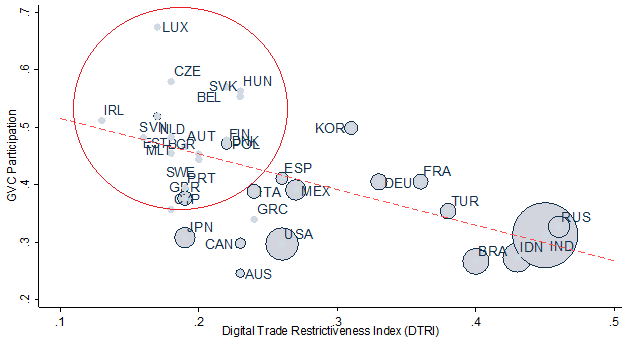 The horizontal axis plots ECIPE’s Digital Trade Restrictiveness Index (DTRI) with higher values reflecting greater digital trade restrictiveness. The graph shows that countries such as Indonesia, India, Brazil and Turkey are more restricted regarding digital trade policies whilst also trading more upstream in GVCs. Contrary, countries which are less restricted in digital trade policies are trading more downstream in their supply chains. They are closer to the final destination of the good (or service), i.e. the consumer. What Digital Policy Restrictions to Focus on? Now that the DTRI is out, I have received the same question various times from different policy officers in the field: what digital policy restrictions should we focus on? The DTRI covers a wide spectrum of policy categories ranging from tariffs in ICT goods to regulations in services and investment to cross-border data flows restrictions. The obvious answer to a trade economist like me would therefore be: well it depends. That’s a cliché, but since economics is about scarcity, decisions need to be made about trade-offs. Personally, I am more interested in the future of trade, namely (digital) services, data and ideas and other intangibles. I think that’s where world trade is heading to and where new large productivity gains will have to come from. That’s not to disregard trade in ICT goods or e-commerce. Precisely if a choice needs to be made, I would argue for these flows to focus on in future policy negotiations. Now, to focus which policies then: the OECD recently released an interesting report in which services trade by modes of supply are estimated. This is a huge step since before we only had a rough idea whether services trade took place through foreign affiliates after FDI was established (i.e. Mode 3), or through the internet (i.e. cross-border called Mode 1). The figure below shows both items in the form of a ratio: Mode 3 over Mode 1 in two points in time, namely 2000 (white dots) and 2014 (blue bars). The figure tells me that the higher the blue bar, the more trade through establishments were important in 2010. When the blue bar falls below the white dot, trade over the internet has become more important over the years to 2014 – and vice versa. Source: Andrenelli et al. (2018), page 21; Analytical AMNE database Note: Exports of foreign affiliates have been removed from cross-border exports. When looking at this figure, some extremely interesting conclusions become visible. One, for some services such as Distribution, Publishing activities, Computer and information services, and Financial and Insurance services, and possibly for Professional and Scientific services, this ratio decreased over time. This means that the internet as a vehicle for trade in these sectors has become more important. In other words, more trade of these sectors has been traded over the internet rather than through foreign establishments. Other sectors such as Construction, Postal services, Warehousing and Transport support, Administrative services or even Telecom, trade through a foreign establishment has become more important over time as the blue bar falls above the white dots (though Telecom already had a high internet-trade ratio). This pattern is very relevant to decide to focus on in terms of policy in services. The services sectors that have seen an increase of internet-based trade are also the ones that Ferracane et al. (2018) have assessed as very data-intensive. These are sectors that use a lot of software and data. These are also the sectors that are mostly affected by data-related policies such as data localization. That’s visible in the figure below. The sectors which are colored in green are the ones which are most data-intensive; the sectors in red are least data-intensive. If a country has comparative advantage in data-intensive sectors, the policy restrictions covered by Cluster C in the DTRI are most relevant: data localization, data retention, intermediate liability and policies related to content access. Source: Author; Note: Data & Software intensities based on US Census data. Conversely, if your country has comparative advantage in say Postal services, Transport, Health or Construction, then it makes sense for policy makers to focus on policies covered under Cluster B of Establishment restrictions. Sure, some trade in these sectors are still traded over the internet, but since complementarities exists between the two Modes of trade, prioritizing establishment restrictions will nonetheless have a knock-on effect on trade in these services over the internet. Ultimately, therefore, choices on what policy to focus on will have to be based on your country’s comparative advantage: where is your country good at in exporting – and how it is traded. Ferracane, M., J. Kren and E. van der Marel (2018) “Do Data Policy Restrictions Impact the Productivity Performance of Firms?”, DTE ECIPE Working Paper Series No. 1, ECIPE, Brussels, forthcoming. Who is going to win the race for AI: China or US? Who will win the race in Artificial Intelligence (AI)? Recent articles have focused on this big battle between China and the US. Arguments appear in favour of both countries. China has huge amounts of data and a more relaxed framework regarding privacy, whereas the US attracts a vast amount of talent to develop software computing and has the good climate to let digital firms with new ideas flourish. Frankly, I think this issue is slightly more nuanced. Arguments on both sides in favor of a strong AI based does not year, however, make clear who of the two will profit best from long-run economic benefits using AI. For instance, it is often pointed out that China has more data than the US and therefore would win the race. To me, it seems that both countries own large amount of data. And due to strong network effects, the fact of having large sets of data just simply points out that the focus is on these two countries, and not for instance on the EU. Hence, both can win. The question who will reap greater long-run benefits from AI is a bit more complicated to answer. Who of the two will have sustainable specialization patterns in AI depends on what economists call comparative advantage. China may be big and therefore have large network effects in AI, but that does not yet mean comparative advantage. 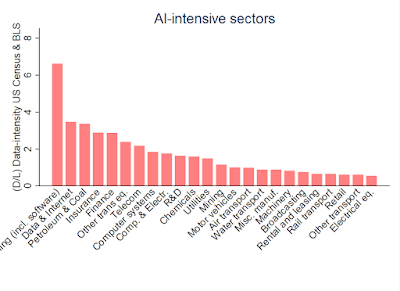 For that to determine, one needs to have a look at what sectors are most amenable to AI. 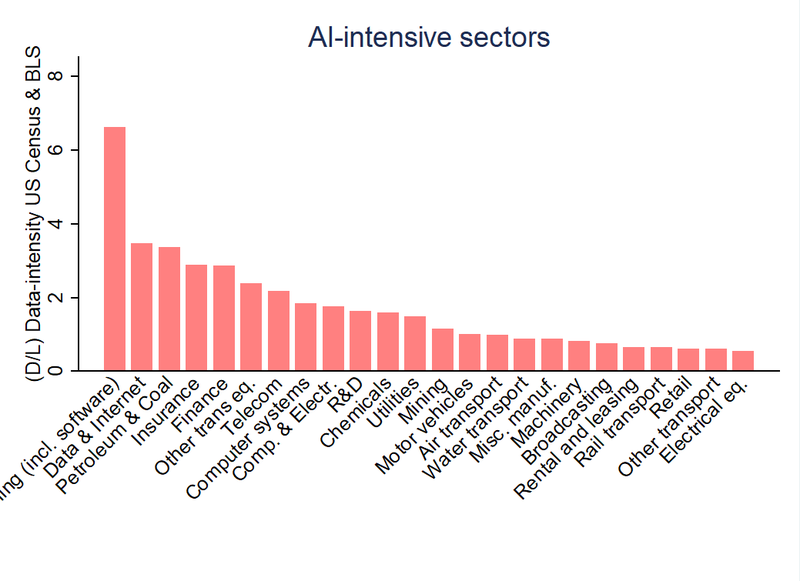 The figure below sets out the most AI-intensive sectors based on current usage of data and software out of a much wider range of industry and services sectors. The figure reveals some interesting insights. For instance, it shows that mainly services appear to be most open to AI such as internet and software services, finance and insurance, computer systems, and logistics. But a couple of manufacturing sectors are also stands out such as chemicals, motor vehicles, computer and electronics and electrical equipment. Source: author’s calculations; US Census; US BLS.